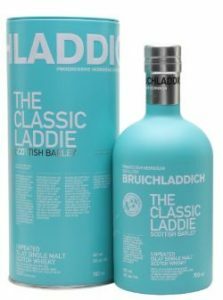 If you are a ScotchÂ lover with a penchantÂ for single malts overÂ blended whiskies, thenÂ Bruichladdich (say â€œbrookÂ laddieâ€), an unpeated,Â Islay single malt, madeÂ from 100% ScottishÂ barley is the one for you.Â Also known as â€œTheÂ Classic Laddieâ€ the multi-vintageÂ cuvÃ©e, matured inÂ American and French oakÂ casks by master distiller Adam Hannett, comesÂ in an eye-catching aqua bottle and tin. The advantage ofÂ a multi-vintage is thatÂ different componentsÂ from other vintages comeÂ into play to give the whiskyÂ its special character addingÂ youth and exuberance.Â Originally created by theÂ legendary, Jim McEwanÂ to showcase the floral andÂ elegant house style, thisÂ unpeated single malt isÂ the signature bottling of the house. Described by the company as â€œsmooth asÂ pebbles in a poolâ€ theÂ whisky is clean, fresh andÂ lively with both, the oakÂ and the barley, in perfectÂ harmony. In short, itâ€™sÂ a good, agreeable dram, one to relax and enjoyÂ with friends, andÂ guaranteed toÂ please.